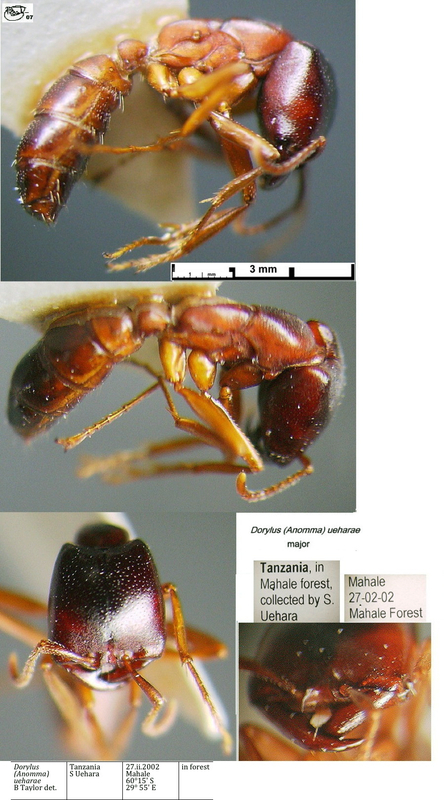 Type location Tanzania, in Mahale forest, collected by S. Uehara, 27 February 2002. .
Named in recognition of the work and support of the late Professor Shigeo Uehara. The photomontages are of specimens from Tanzania, collected by the Chimpanzee study project led by the late Professor Shigeo Uehara. The various morphs are shown in detail on the Dorylus (Anomma) ueharae morphs page. See the Website for details of the research and location. Descriptions - TL 8.55-4.5. At least four morphs. Distinctively bicoloured, with head near black, alitrunk chestnut orange and gaster darker, near black apically. Head near rectangular, longer than wide. Mandibles with large triangular basal tooth, subapical teeth reduced to bumps, sculpturation of faint rugae and distinct hair pits. Antennal insertions very close to anterior margin of head, frontal carinae notably raised and extending forward over anterior clypeal margin; latter near straight, with long downcurved median hair and shorter hairs each side. Scapes short and stout, thickening from base to apex, latter near twice as wide as base. Funiculus with all segments except apical, stout but slightly longer than wide, dense coarse pilosity giving a bristly appearance; apical segment forming a distinct club. Alitrunk profile with flat dorsum but rounded margins, propodeum smoothly curved from dorsum to declivity. Petiole globulose, as high as long; no subpetiolar process, several moderately long subpetiolar hairs. Legs quite long, with very distinct large claws; tibiae and tarsi bristly like funiculi. Head overall with dense spiculation and marked spaced out hair pits. Alitrunk, petiole and base of gaster densely spiculate. No erect hairs on dorsum of head, alitrunk, petiole or gaster. Short decumbent pilosity on head and on anterodorsum of pronotum. 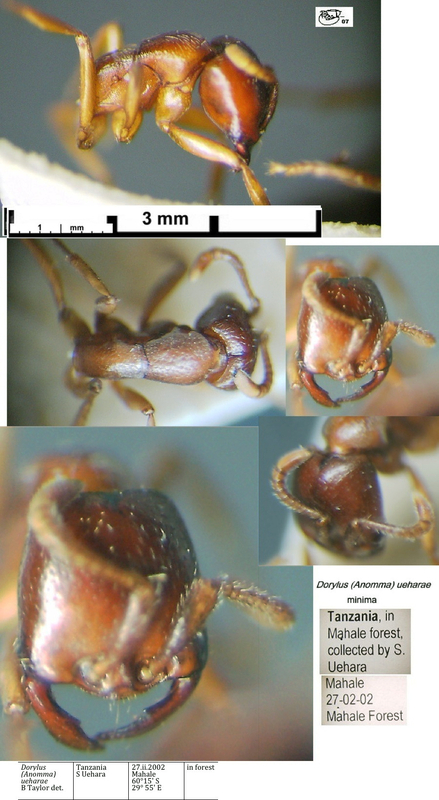 Shows similar shape and mandible form to that of Dorylus (Anomma) lamottei.